The recovery of the Dutch construction sector continued in 2016, but there is still overcapacity in the market, and a consolidation has yet to take place. In line with the overall Dutch economic performance the construction industry continued to grow in 2016, which also benefitted related segments like construction materials and engineering. The strong growth in the housing market provides an additional stimulus for private consumption. 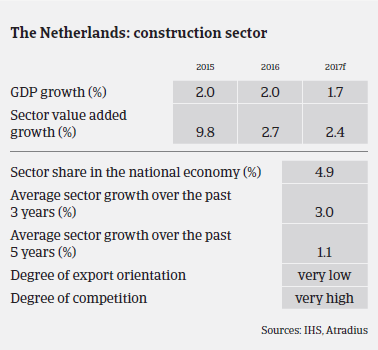 In Q3 of 2016 construction was the fastest growing trade sector in the Netherlands, and turnover and gross added value have increased for the past eight quarters in a row. Home prices have further increased, and the sentiment of many construction companies remains positive, with businesses expecting further revenue increases in 2017. 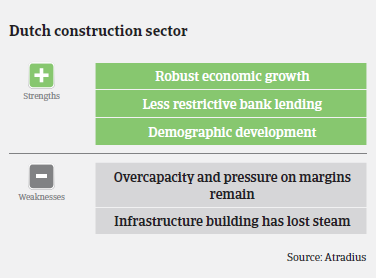 In 2015 the recovery in the Dutch construction market was rather one-sided, driven mainly by growth in the residential construction segment, while the non-residential subsector, especially utility construction segments, still faced modest demand. Residential construction continued its increase in 2016 and is expected to grow further in 2017, although below 2008 pre-crisis levels. Meanwhile demand for non-residential construction picked up in 2016. Civil and utility construction have shown robust growth in 2016, and production even increased 13.4% year-on-year in Q3 of 2016. However, utility is a very diversified subsector, where developments in single regions also vary: demand for offices and hotels as well as brick-and-mortar shops is higher in Amsterdam than in less central communities. Despite the upturn, pressure on businesses’ margins remains in this segment. The infrastructure segment has also partly benefitted from improving market conditions and government spending in 2015 and 2016. However, infrastructure expansion has lost steam in H2 of 2016, with production decreasing 4.5% year-on-year in Q3. Roads, tunnels and railroad builders reported a 5.8% decline, and it seems that the infrastructure-related expansion has ended for the time being. After a steep increase during the crisis years, a decrease in non-payment notifications and credit insurance claims has been recorded since 2015, and it is expected that non-payments and insolvencies will further decrease in H1 of 2017. Compared to 2015 loan policies of banks towards construction companies eased last year. However, the on-going strong competition in the market indicates that many Dutch construction businesses remain affected by price wars, leading to on-going pressure on margins. There is still overcapacity in the market, and a consolidation has yet to take place. 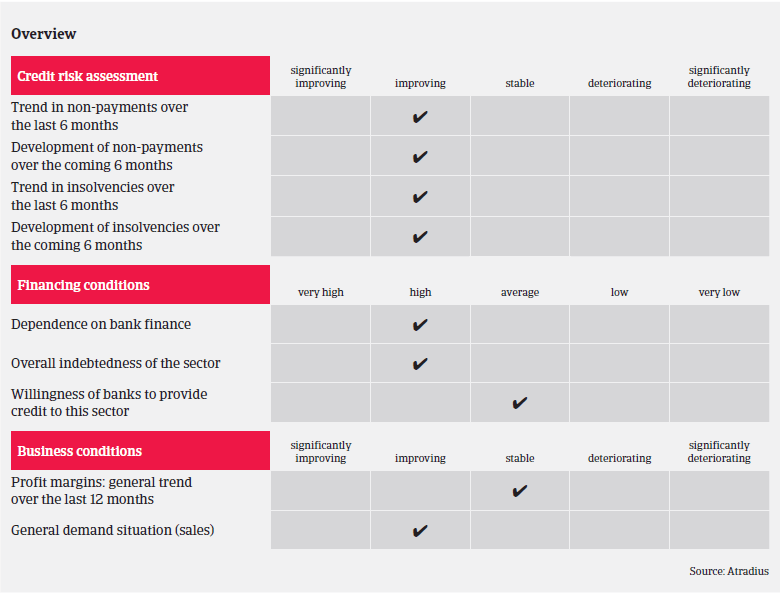 Given the robust performance in 2016, decreased insolvencies and the positive outlook for 2017 we relaxed our underwriting stance last year. However, more attention is currently given to businesses active in the infrastructure segment because of shrinking order books. When assessing a buyer’s creditworthiness, we require up-to-date financial information, and details of their 2016 order book and payment experience. Additionally, we seek details on a company’s financing (covenants/securities) and the maturity dates of bank loans. Our aim is still to maximise the insurance cover we can give our customers, and in this respect third party securities, if available, can help. Smaller food retailer and wholesalers margins remain under pressure and are expected to lose further market share, while customer behaviour is changing. Despite a firm grip on trade receivables management, 1 in 5 respondents in the Netherlands had to delay payments to their own suppliers.